Home / Field Geeks / Baseball / Is CC the DDifference? The ALCS has come down to a seventh and deciding game. Who will advance to the fall classic? Talk about pressure on a young team for the Yankees. However, as proven by surviving four elimination games thus far, the Baby Bombers and their teammates seem to thrive on it. Having their backs against the wall fuels them. Another disadvantage is facing the partial home crowd in Houston. The Yanks have dropped 5 road games in the playoffs. However the lone victory was elimination game 5 in Cleveland. Mind over matter, boys. Joe Girardi set his starting pitching line-up for the ALCS with the possibility of a decisive game 7 in mind. On the mound tonight will be the big guy, the most experienced post season player on the team, CC Sabathia. 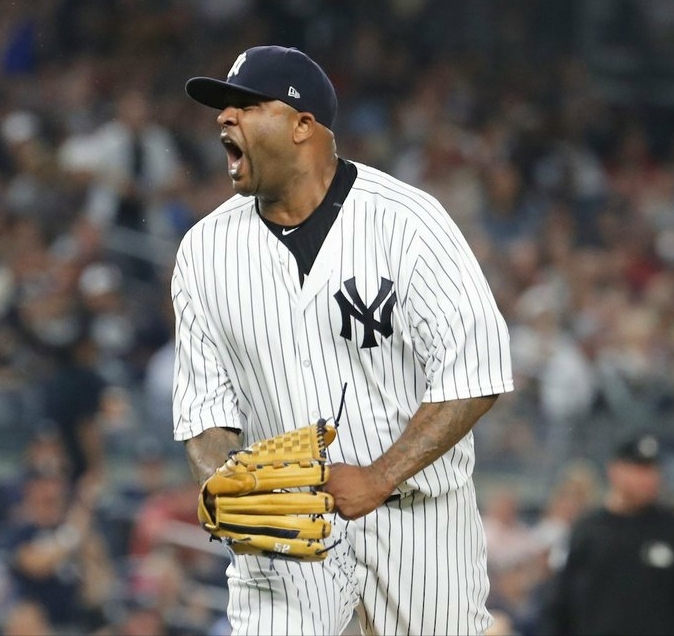 A World Series champion and Cy Young winner, CC enters this game with an 8-2 post season record as a Yankee and a 2.30 ERA in the month of October. It will be his 23rd post season game. The 237 game winner predicted a Yankees win last night following the game 6 loss saying, “We’ll come out tomorrow and play a great game and win tomorrow.” Following a Yankees loss this year, CC is 10-0 in 13 starts with a minuscule 1.69 ERA. A bold claim? No that’s just CC who is an obvious team leader and favorite. He has battled back from many setbacks, including a knee that certainly will need to be replaced at some point in his life. He thought he would have to retire earlier in the season due to knee pain, but a short DL stint later, he was back and sharp. He came back from personal demons, entering rehab for alcoholism 2 years ago. He has emerged as the 37 year old veteran, having a great season and leading his younger counterparts on this team. Enthusiasm is infectious and with his confident claim of a victory and the way CC goes about his business, his fire can’t help but trickle down to the rest of the Yankees. Look for his signature fist pump tonight and encouragement of his teammates when they make plays. It’s CC and no one is better at inspiring others to do their best. Facing the Yankees for the Astros is Morton. He threw game 3 which the Yankees won and as a result has a 0-1 record and 10.13 ERA in the ALCS. The Bronx Bombers can get to him. They will too. In a winner-take-all game anything can happen. All pitchers are available for the Yankees except David Robertson. For the Astros we might see Keuchel out of the pen on 3 days rest. It will be an interesting event, no doubt about it. But the way things stack up and will play out, I see the champagne popping in the visitor clubhouse. The stars are aligned and the best man available is out tonight to close the deal. CC Sabathia’s prediction will come true! Let’s GOO YANKEES! On to the World Series!